The deadly use of the “Long Lance” in surface battles in the Pacific is accurately and graphically described in The U.S. Navy Against the Axis: Surface Combat, 1941-1945 (five stars) by naval historian Vincent O’Hara. I associate torpedoes with submarines and I often lose sight of the critical role played by torpedoes in surface action between warships. Perhaps I do this because it seems intuitive that surface ships would use naval guns and counter-intuitive that these same ships would employ torpedoes but they did and often to deadly effect. On the night of 1 March 1942, the last hours of the Battle of Sundra Strait, from roughly 2300 (11:00pm) to midnight, Japanese warships, mainly destroyers, fired forty-nine torpedoes against two Allied cruisers, the heavy cruiser USS Houston and the light cruiser HMAS Perth. The two cruisers managed to escape serious damage during that hour of twisting and turning but just after midnight the Japanese fired thirty-five torpedoes in only four minutes. Both of the Allied cruisers were hit numerous times. At 0012, the HMAS Perth rolled over and sank and at 0025 the USS Houston went down. 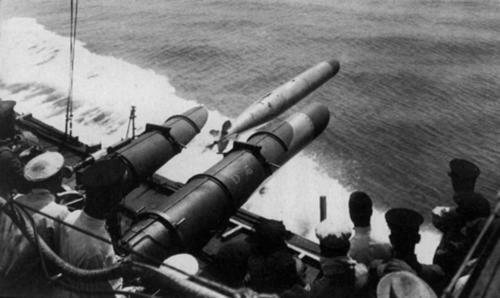 Japanese destroyer Inazuma launching a type 93 long lance torpedo against allied ships in the Second Battle of the Java Sea.